At the IT Industry Showcase (part of Otago Polytechnic’s Excite), David Dyer and Owen Miler showed off their capstone project. 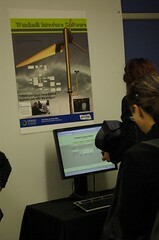 They developed an integrated system for monitoring and managing the clients’ innovative power generating windmill. As the client’s are not yet at the field-test stage of the actual windmill, the group’s project was to help the development team to understand the role IT can play in the management of such a generation system. • Provide a local interface for the wind turbine for the client. It would provide at a glance feedback on status, and overall performance, and have a second level capability to change machine set up and get deeper performance reports. • Provide a monitoring service via a central service facility which would get routine and exception reports on the performance of every turbine. • A diagnostic facility which could be used either locally or remotely to investigate performance problems, and plan solutions for any turbine. • A facility for providing additional data gathering capabilities for selected machines that would be field test prototypes. desktops that the customer uses all the time. • Other ideas that may come out of going down the path of using IT technology to make the experience of owning and operating a windmill easier, and more satisfying and interesting than it would be otherwise. We have been very impressed with how Dave and Owen have undertaken the development. They have shown good skills in negotiating the brief, in quickly prototyping and testing concepts, and in checking back with us for feedback. In the end they have come up with a rather sophisticated database driven solution with a web interface, which seems like a very good model for us to follow as we approach having field test, and soon commercial machines. Solutions to all of the aspects of the brief above have been developed and demonstrated. We have been very impressed by the enthusiastic and efficient approach that Owen and Dave have made to us. In conclusion, we think they have followed a good process, demonstrated excellent skills both in the technical and human sides of running the project, and have come up with a great prototype of the solution.